Hey, everyone! 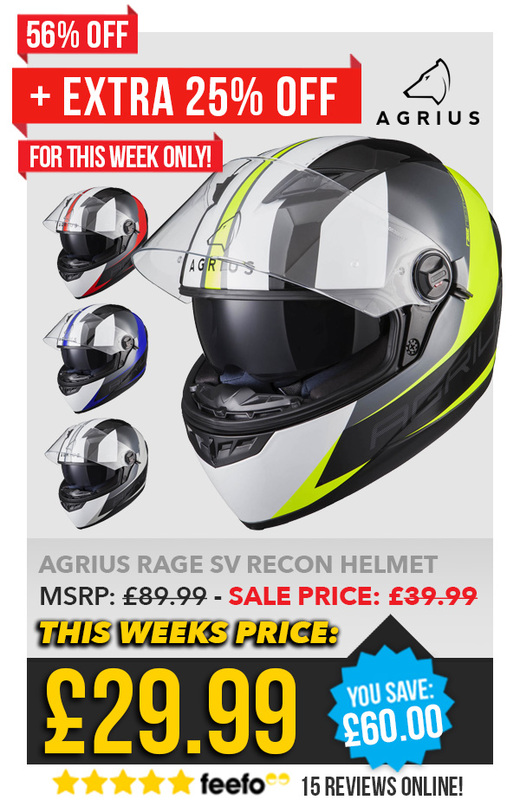 Another of our Agrius Rage SV helmets is up for grabs at a bargain as part of our Deals Week offers! The Agrius Rage SV Recon Motorcycle Helmet is a brilliant lid, looks great, is really safe and we’re really proud of it! Our Agrius Rage Helmets really are great helmets and mine is still one of the best helmets I’ve ever had. They’re our own brand so we like to keep the price nice and affordable which enables newer riders to get themselves a brilliant and safe helmet at an affordable cost. They’re light, the padding makes it a pleasure to wear and it’s even fully removable for washing. It has a sun visor for bright days, a micro-metric buckle for easy fastening and it’s 4 Star Sharp Rated for safety – a feat some £100+ helmets even struggle to achieve. For our Deals Week price of just £29.99, get yourself an Agrius Rage SV Recon and what I would personally call the best value for money deal we have going this week- it really is a fantastic lid. I would highly advise getting yourself the Agrius Rage Pinlock Insert to go with it though and keep your visor fog-free in the cold. It really does make all the difference and with it in you’ll wonder why you never got a helmet with one before.